Passages to the Past is pleased to be hosting author Brandy Purdy with a giveaway as part of her virtual tour with HF Virtual Book Tours for the release of her latest novel, The Queen's Rivals! Brandy is on tour through August 7th, so be sure to check out the schedule of stops below. Their ambitions were ordinary, but they were born too close to the throne... As cousins of history's most tempestuous queens, Ladies Jane, Katherine, and Mary Grey were born in an age when all of London lived beneath the Tower's menacing shadow. Tyrannized by Bloody Mary and the Virgin Queen, the sisters feared love was unthinkable —and the scaffold all but unavoidable... Raised to fear her royal blood and what it might lead men to do in her name, Mary Grey dreads what will become of herself and her elder sisters under the reigns of Mary Tudor and Elizabeth I. On their honor, they have no designs on the crown, yet are condemned to solitude, forbidden to wed. Though Mary, accustomed to dwelling in the shadows, the subject of whispers, may never catch the eye of a gentleman, her beautiful and brilliant sisters long for freedoms that would surely cost their lives. And so, wizened for her years, Mary can only hope for divine providence amid a bleak present and a future at the whim of the throne — unless destiny gains the upper hand. A gripping and bittersweet tale of broken families and broken hearts, courage and conviction, The Queen's Rivals recounts an astonishing chapter in the hard-won battle for the Tudor throne. Please note this book will be published in the UK on September 12, 2013 as THE FALLEN QUEEN by Emily Purdy. Brandy Purdy (Emily Purdy in the UK) is the author of the historical novels THE CONFESSION OF PIERS GAVESTON, THE BOLEYN WIFE (THE TUDOR WIFE), THE TUDOR THRONE (MARY & ELIZABETH), THE QUEEN'S PLEASURE (A COURT AFFAIR), and THE QUEEN'S RIVALS (THE FALLEN QUEEN). An ardent book lover since early childhood, she first became interested in history at the age of nine or ten years old when she read a book of ghost stories which contained a chapter about Anne Boleyn haunting the Tower of London. Visit her website at www.brandypurdy.com, you can also follow her, and her cat Tabby, via her blog at http://brandypurdy.blogspot.com where she posts updates about her work and weekly book reviews. Passages to the Past has one copy of The Queen's Rivals up for grabs. To enter, please complete entry form below. Giveaway is open to US residents only. Ends on June 28th. Review & Giveaway at Oh, for the Hook of a Book! Thanks for the giveaway! I can't wait to read this! I would love to win a copy! I really enjoyed Brandy Purdy's last two, and am definitely looking forward to this one as well. What a great upcoming schedule. I look forward to reading more about these books. 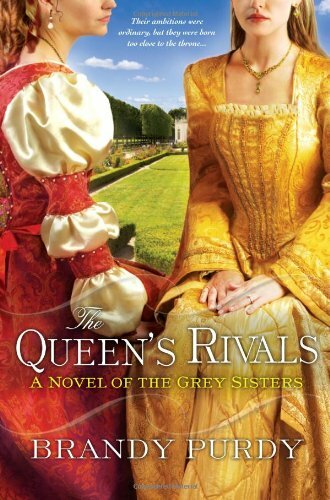 “The Queen’s Rivals” sounds wonderful. I’ve always thought that the time of the Tudors must have been so frightening especially for those living at court. When I read or watch something about that time period, I find myself chewing my nails because one never knows what’s going to happen.